SAN DIEGO, June 16, 2006 -- An advanced APX slow-motion digital camera developed by Photron Inc. of San Diego is part of Emmy award-winning SwingVision technology used in "Golf on CBS." The creators of SwingVision, Gene O'Connell, Matt Kearney and Justin Hall of Tech Imaging Services Inc., Photron's exclusive northeastern US distributor in Salem, Mass., received the 27th Annual Sports Emmy for the George Wensel Outstanding Innovative Technical Achievement from the National Academy of Arts and Sciences at ceremonies last month in New York City. The SwingVision system uses Photron's advanced high-speed APX digital camera, customized broadcast optics developed by Tech Imaging Services, a fiber optic output and proprietary software. This slow-motion replay capability, which has been used in the imaging technology by CBS Sports since 2004, captures the full range of a golfer's swing at 1000 f/s. A second APX camera captures images of close-up action at 12,500 f/s of the impact of the club on the golf ball, revealing precisely where the face of the club strikes the ball and the actual compression of the golf ball as it is struck. Photron's APX high-speed imager features a shutter speed of 1/50,000 of a second (20 µs) to provide clear images with no blurring at the moment of impact. 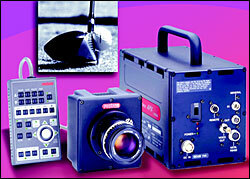 The footage is used for immediate live transmission and instant replay in super slow-motion for swing analysis. Andrew Bridges, manager of sales and marketing at Photron, said Tech Imaging has worked closely with CBS for the past three PGA seasons to perfect the slow-motion imaging of golf on TV with SwingVision.